The following analysis originally appeared in Tehelka Magazine, in the February 9, 2008 issue. JANUARY HAS BEEN a torrid month for the US economy. Risky lending on property has hit banks, real-estate sales have fallen 12 percent, and the stock market looks dangerously bearish. To stave off a recession, the Federal Reserve slashed interest rates and Washington unveiled a $156 billion stimulus package. Pessimism concerning the American economy is causing ripple effects and losses are pegged at $5 trillion. 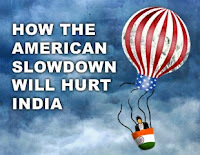 Economists and politicians have tried to downplay the impact of a US slowdown on India. But, even a minor slow-down in the US market could hurt India. The US is the largest consumer market, valued at $10 trillion a year: ten times India’s GDP. It accounts for 15 percent of Indian exports, worth almost $19 billion in 2006-07. Of these, almost half consists of jewellery, precious metals and precious stones ($4.8 billion) and clothing and textiles ($4.4 billion). While the latter may be unaffected, the former could be casualties to American belt-tightening. India could also suffer from jolts to the global supply chain. For instance, India’s sizeable exports of iron ore to China may be affected as the demand for Chinese products decrease in the US. Indian imports from the US, $11.7 billion in 2006-07, are not likely to suffer much, and could gain should the dollar weaken further. On investment, India should remain insulated: US FDI to India is a paltry $850 million while Indian investment in the US is about $2.2 billion. It’s too early to ascertain if a recession is imminent, let alone estimate its effects. The US may ride out this economic blip, as in 2000-2001. Consumer confidence, which dropped precipitously in late 2007, appears to have rebounded in January. Prevailing pessimism, however, means that the days of plain sailing for the global economy appear to be, at least temporarily, over.